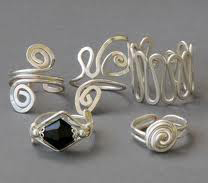 Enjoy designing and making your own rings. The most simple silversmithing techniques will be covered: bending, coiling, hammering, soldering and bezel setting. Demonstrations will be given on each technique and then students will have time to create two or three rings with one-on-one instruction. No experience necessary. Materials included in fee.